There is no doubt that the Joker is one of the greatest villains in the comic book world. The Crown Prince of Crime has plagued Batman for many years now, and he will never go away for good. The Joker has found the very need to have a partner, and he found his match in Dr Harleen Quinzel. While she had treated him at Arkham Asylum, Joker had seduced and also manipulated her, by using her to escape. Harleen had then became Harley Quinn, and she had devoted herself to the Joker. She had spent many years helping him in all his psychotic schemes. The Joker and Harley are not really a great example of a good couple. In spite of the trauma Joker puts her through, they always get back on the good figurative horse. Harley had taken a few of Joker’s henchmen with her and this infuriated, the Joker and he demands retribution. He then pummels Harley, saying that he should have killed her, he then He offers Harley some flowers, but this is a ruse. 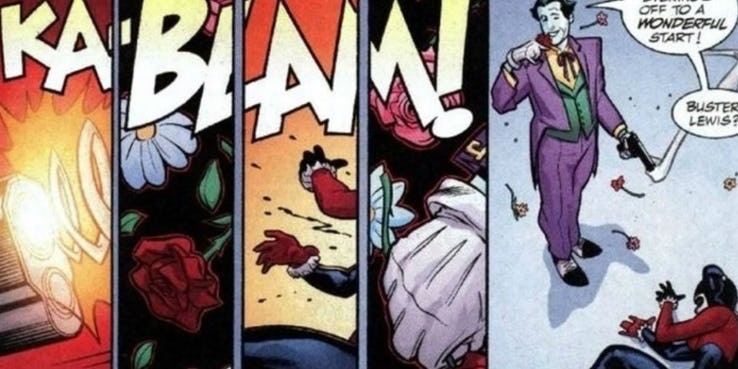 The Joker shoots her in the stomach with a gun that is hidden inside the bouquet, and luckily Harley survives this. 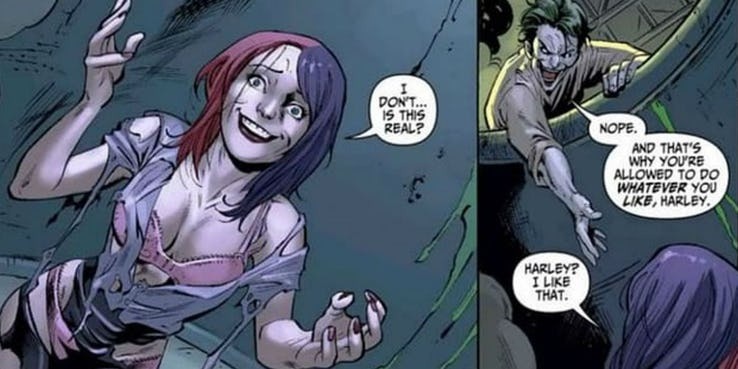 In the New 52, Harley had still been a psychologist, like she was and had fallen in love with the Joker. This time instead of choosing to become the Joker’s sidekick, he had made the decision for Harley. The Joker believed that he wanted some display of commitment from Harley and so, he threw her into a vat of chemicals. 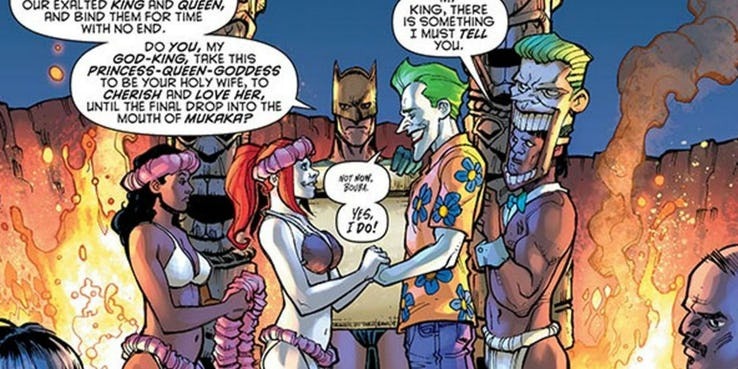 In Harley Quinn: Future’s End, Harley and Joker decide to get married on a volcano, and after Joker finishes his vows, he prepares to throw her into the volcano. Joker then reveals that he never wanted to marry Harley. The tribesmen then are the full moon needs two blood sacrifices. 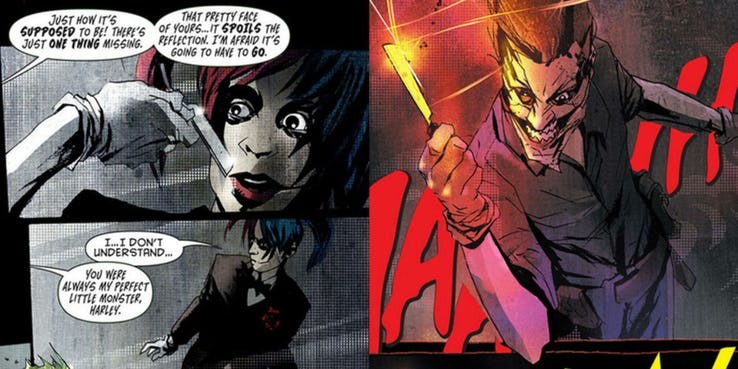 Harley then gets a kick out of Joker’s plan, fails and makes peace with the very notion that they will be sacrificed. The volcano then explodes, and Harley is away from danger. In #663 of Batman, the Joker was shot in the face by a Batman impostor, and also trapped in Arkham Asylum. The Joker then has Harley lure Batman into Arkham Asylum, but this is just a trap for Harley and the Dark Knight. After Batman had arrived, he says that he wanted to save Harley, and also reveals the Joker’s intent to kill her. The Joker then held a razor to her throat, but she had escaped. 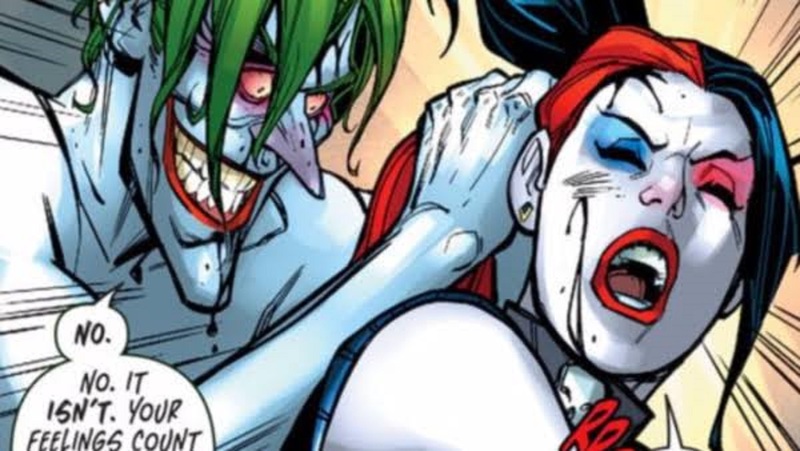 In Suicide Squad, Joker had allured Harley and also used electrotherapy to torture her. There is one theatrical cut, but there is an extended version where there is one minute of physical and psychological horror being unleashed. This Harley Quinn is not so much the Joker’s accomplice as she is a victim. She was driven mad by the abuse. 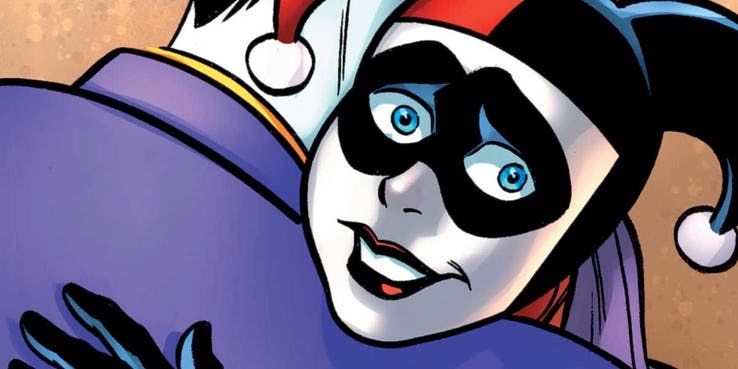 Harley Quinn’s debut appearance in DC Comics had been in “No Man’s Land”. Here, Harley transforms from her doctor persona to Harley Quinn. She was very clever, but the Joker ignores her and Harley’s insights are always overlooked. 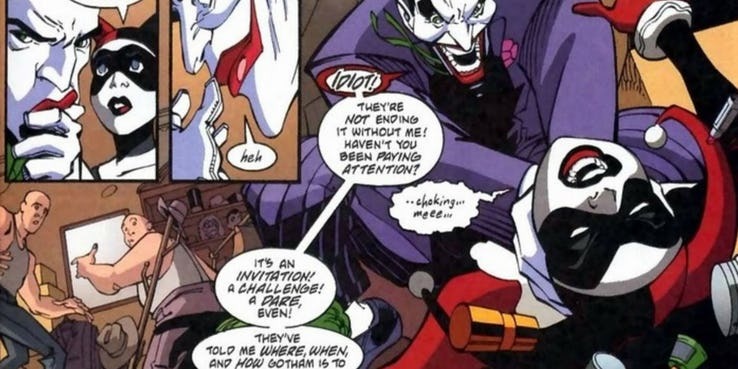 Instead of dealing with all his emotions in a calm way, Joker tries to choke and kill Harley. 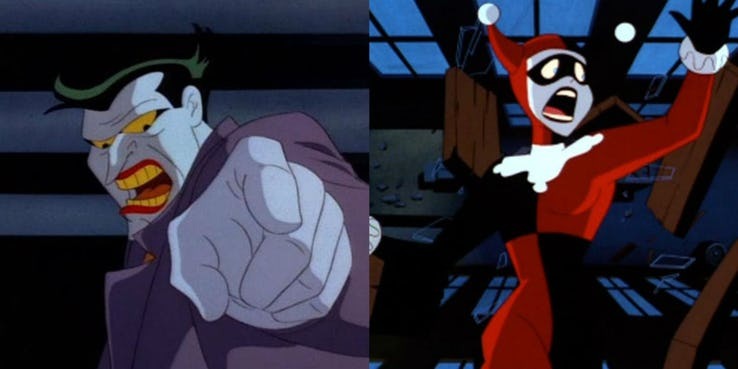 In the episode “Mad Love”, Harley had tried to prove herself to the Joker and even gave him a surprise gift by killing the Dark Knight. She had used one of his failed blueprints. The Joker had been furious and was threatened, then he attacks Harley, and knocks her out of a window. 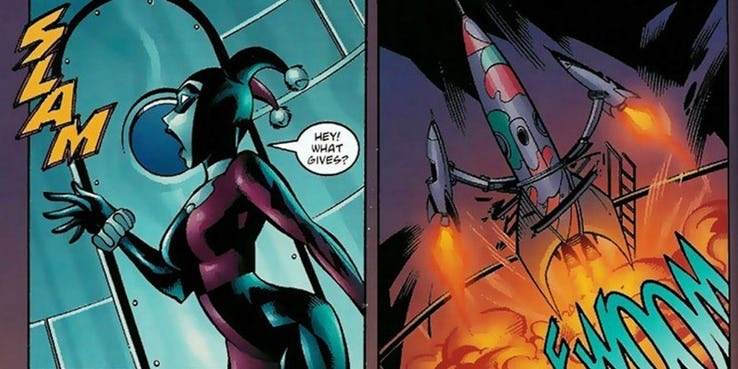 One day Harley had gotten a note from the Joker, and this instructed her to meet him at a rocket ride. She then goes, but when she enters the rocket, there is only a video screen. After the video plays, he presses a button, locking Harley in the ride and launches her into space. For their 7th anniversary, Harley had decorated herself with a cake and even sang songs for Joker, but the villain does not get a laugh from the tune and tells Harley that he is in no mood to celebrate. He then throws her into an alley filled with hyenas. The New 52 Joker is a terrifying and he had tried to destroy the bonds between Batman and his family. The Joker then dressed Harley up in his old tuxedo and contemplated cutting her face. Harley had first resisted and then gave in to all his demands. Luckily for Harley, he did not go through with the plan.